OTTAWA — The head of the coalition of independent senators says Prime Minister Justin Trudeau must quickly kickstart changes to the law guiding life in Parliament to truly fulfil his promise of an independent Senate. Absent any government action, Sen. Yuen Pau Woo argues the Senate will operate with more difficulty than it did when it was drawn along purely partisan lines. The number of independent and non-affiliated senators has reached a tipping point in the upper chamber where they make up more than half of all senators, the majority of which are in Woo's Independent Senators' Group. 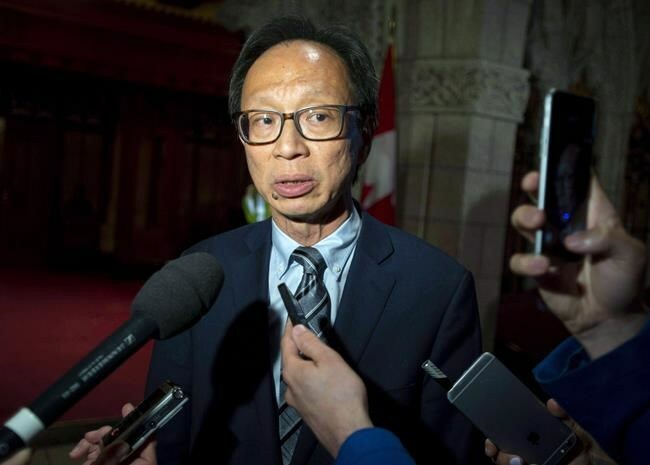 Woo hopes the numbers give him the heft to push the Liberal government to change the Parliament of Canada Act to officially recognize groups of senators who are neither part of the government nor the official Opposition. The change would give groups not affiliated with a party a guarantee of money to spend on research, dedicated time to talk about legislation, membership on committees and a role in day-to-day decisions about Senate business — rather than the temporary agreements currently in place. Only the government can initiate the required changes to the act because they would affect funding for senators and the Senate is constitutionally prohibited from introducing spending bills, Woo says. In a wide-ranging interview with The Canadian Press, Woo argued that Trudeau has only dealt with half of his promise for an independent upper chamber — he's appointed non-affiliated senators but hasn't dealt with the backroom processes to cement their promised independence. When he was told he was being appointed to the Senate, Woo said the prime minister told him he didn't have a road map for how the upper chamber would achieve the independence he promised during the 2015 election campaign. Woo said the Senate can't draw the road map itself unless Trudeau provides senators with the tools to do so — "and he hasn't done that yet." "Most of us kind of took it at face value and assumed that we would figure out a road map," Woo said. "I have been in the Senate now for two years and what I've learned is that the road map depends on him (Trudeau) to finish the job. He hasn't finished the job and that is a message that I hope is heard loud and clear." On Tuesday afternoon, Democratic Institutions Minister Karina Gould told the Senate she's willing to "entertain" changes to the Parliament of Canada Act. "I think this is something that should be done," Gould said. "However, I would leave that up to honourable senators to decide." Woo is hoping voters will debate the future of the Senate during next year's election campaign but under different circumstances than 2015, when the shadow of scandal fuelled Trudeau's promises to overhaul the appointment process. Instead of political appointments made directly through the prime minister — a process scorned for filling the chamber with partisan hacks, flacks and bagmen — Canadians are now free to apply to an arm's length advisory board, which vets applicants and recommends short lists of potential Senate nominees, from which Trudeau fills vacancies in the upper house. Tory senators blame the new process for problems in the upper chamber's procedural machinations. Conservative Leader Andrew Scheer has also publicly talked about reverting to the traditional system of partisan appointments. If Scheer wins next year's election, Woo estimated it would take him a decade to appoint enough Conservatives to win back a majority in the Senate. He argued that Liberals and Conservatives alike need to figure out how they will handle the bloc of independent senators who "are not going to go away." "With the superior numbers of non-Conservative senators, an unreformed Senate could become very difficult to manage unless there is some reckoning of the new realities of the Senate," Woo said. "The real question is we have a Senate, how do we want it to function? What's the best way for it to function? And the very concrete experiment that we are undergoing now is that of the independent appointment process and the non-partisan, more independent structure." The NDP want to abolish the Senate, but the Supreme Court of Canada has set a high bar for that possibility — unanimous agreement of all provinces. The Independent Senators' Group numbers 52 — half of the 105-seat Senate, not including the Speaker. Its members can't be active in any party, but they can hold party memberships. Woo said his members hold myriad political views, including on the role of government and the private sector. "We're not pretending to be monks and nuns," he said. "We have views on politics and that is in fact a strength of the new appointments where people come not as blank slates, but they bring their life experience, potentially, including policy and small-p political experience to the review and deliberation of legislation."